Pat pork chops dry with a paper towel. In a small bowl, combine Pork Chop Seasoning ingredients (black pepper, garlic salt and poultry seasoning). Stir to combine; then rub seasoning onto both sides of the pork chops. In a shallow pan, combine Seasoned Flour ingredients (flour, bread crumbs, black pepper, garlic salt, poultry seasoning). Mix well. Pour oil into Dutch oven until 2 inches deep. Heat over medium-high heat until temperature reaches 300 degrees F. Carefully place coated chops into hot oil. 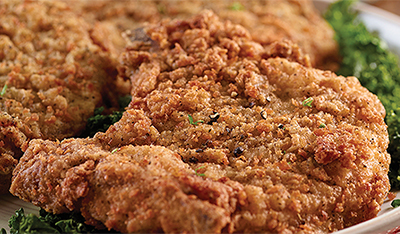 Fry until chops are browned and internal temperature reaches 150 degrees F, 10 to 15 minutes, turning occasionally.